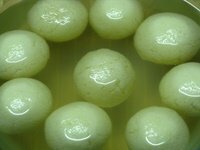 Rasgulla recipe for making spongy rasgullas at home. 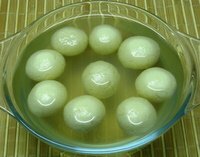 Rasgullas are homemade cheese or paneer balls cooked in a sugar syrup and served chilled. This recipe is made using a pressure cooker. Although you can make it using a big saucepan (make sure you make extra sugar syrup and keep it hot and keep topping up the syrup in the sauce pan. Total cooking time should be 12-13 minutes on a high flame). Divide this kneaded or processed paneer into 10 or 12 portions. Make smooth round balls out of each portion by rolling it in between your palms. When cooled, add 1 Tsp of rose water to the syrup, stir very gently, so as to mix. Refrigerate the rasgullas and eat chilled. In case the rasgullas turn out hard. Cut them up and add to the Sevian kheer sevian kheer recipe. Serve them with kulfi or ice cream. Chill them in thickened milk and sprinkle with pistachios.